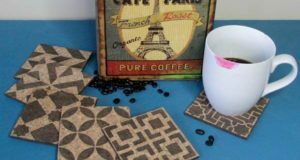 How much do we, DIY’ers love discovering a new product that gets our creative juices flowing! It’s just so addictive! 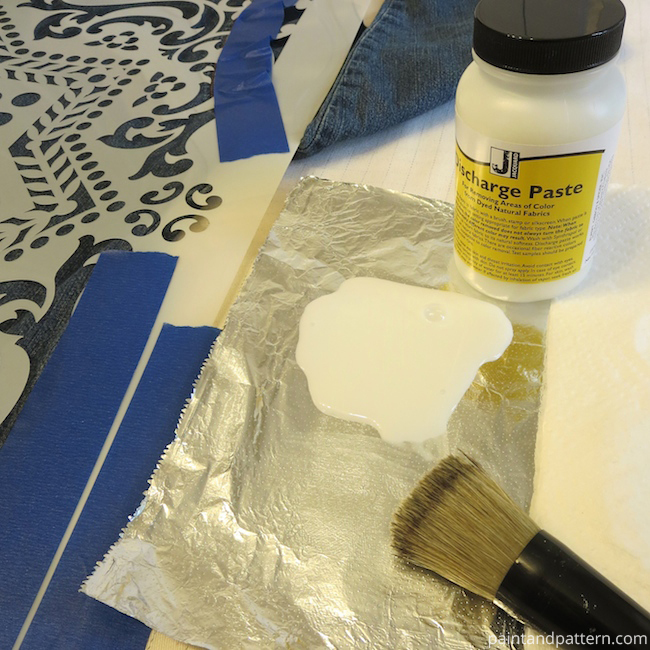 Recently I read a DIY post on Paint + Pattern that used a product called Discharge Paste. Basically, this paste removes the dye from natural fiber fabrics. It is easy to stencil and safely removes color from fabrics – even silk. It is not bleach, so it won’t weaken or deteriorate your fabric. As soon as I saw it, it became a “must-try-now” project for me! Immediately I dug around my closet for opportunities – meaning something inexpensive and something that was a 100% natural fiber. 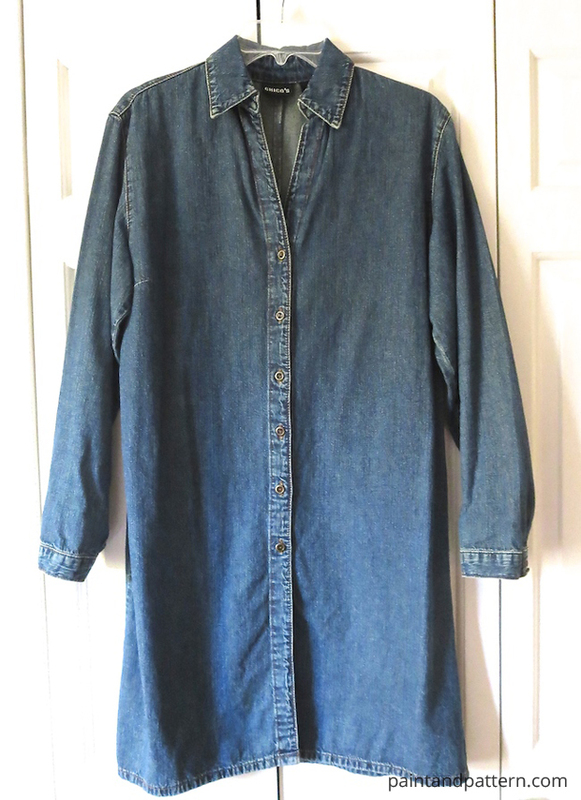 I found a plain long denim jacket that I had picked up at a designer consignment shop for about $15. Perfecto! 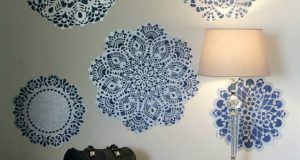 First, I recommend browsing through all of the Tips & Tricks on Stenciling with Discharge Paste from Royal Design Studio. 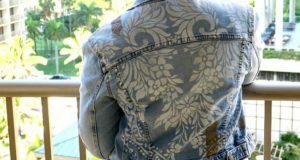 Once you know the basics of the process, here are a few quick steps for stenciling on the denim jacket. 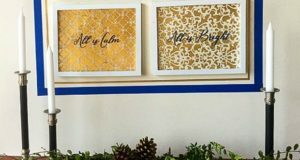 I used the Lisboa Tile stencil for this project as it coordinates nicely with Paint + Pattern’s focus on Latin America during the month of May. STEP 1: Iron the jacket well, so the stencil will lie as flat as possible. STEP 2: Pour some Discharge Paste on a piece of aluminum foil and fold a couple of pieces of Bounty paper towels to offload extra paste from the stencil brush. STEP 3: Stencil as usual using a swirling or pouncing motion. I stenciled three times since the denim did not release color easily, letting dry about 20 minutes between each layer. STEP 4: Remove the stencil. At this point, it’s difficult to see your work. STEP 5: Iron on high heat. 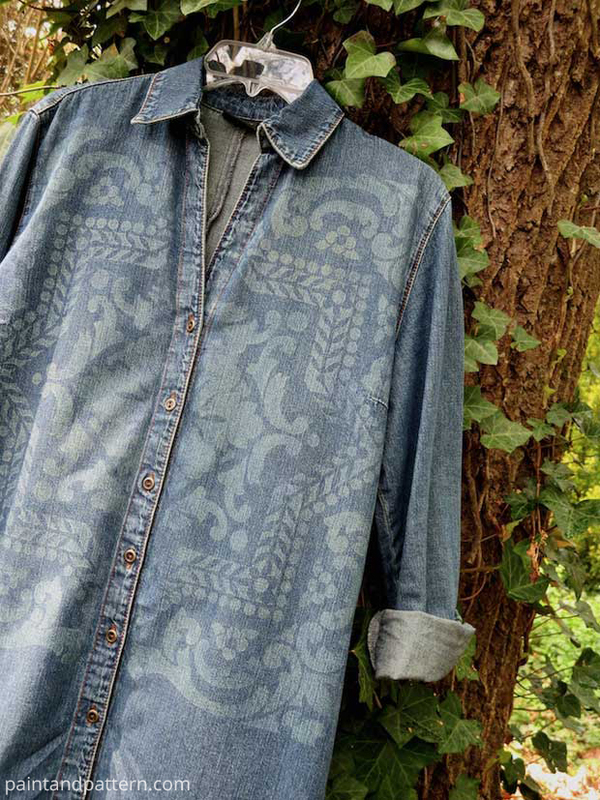 The longer I ironed, the more the pattern appeared, taking on a slight green hue, which I loved with the blue of the denim. How do you like the final look of this jean jacket? I absolutely adore the way it turned out. 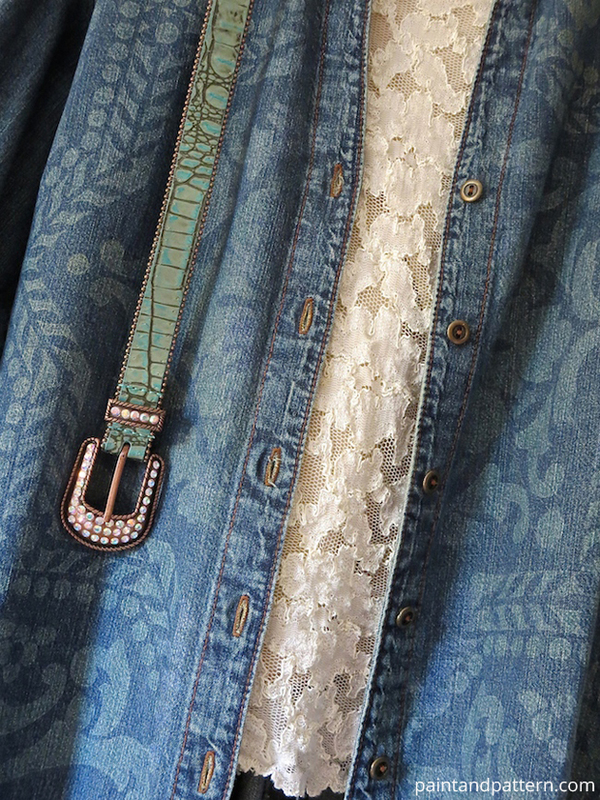 Just a hint of pattern with a bonus color which I assume only happens with denim. I suggest to always do a little test in one corner of your fabric first to be sure you like the results. 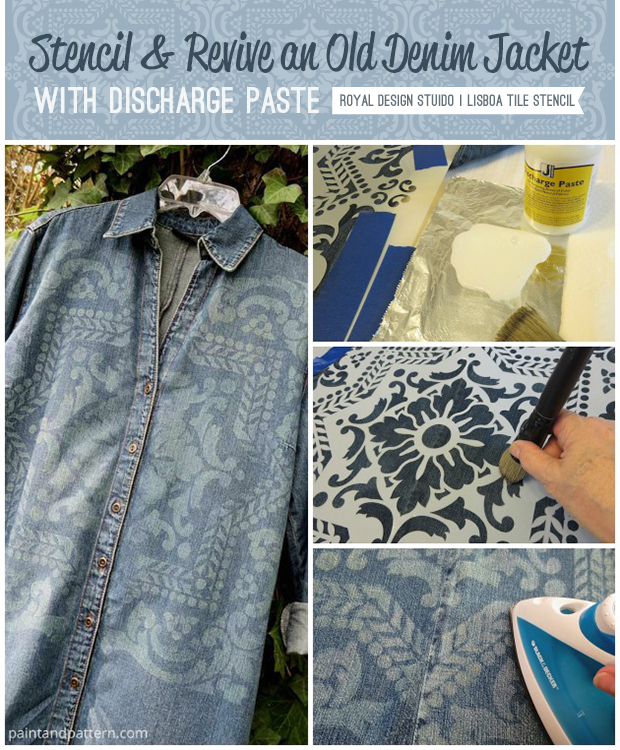 So, are you ready to try some stenciling with Discharge Paste? It’s inexpensive and goes a long way. This project only used up a third of a bottle, so there’s plenty more to play with. Now I’m thinking about a tote bag or even a leather jacket. Hmmm…. If you have fallen in love with this denim jacket, it can be all yours! All you need to do is visit my blog My Patch of Blue Sky and enter to win this jacket along with a brand new Lisboa Tile stencil from Royal Design Studio. Also, be sure to get your promo code for a discount on the Discharge Paste from Royal Design Studio. Good luck and let us hear from you when you finish your project! Too cool – would use to make a cool tablecloth for outdoor use for summer picnics. Can’t wait to try………..oh and I also have many pair of jeans with paint on that I could try. I have never heard of this technique! I love it. The jacket is so beautiful. Thank you for sharing this with me. I would take fabric and create unique designs for one of a kind pillows! 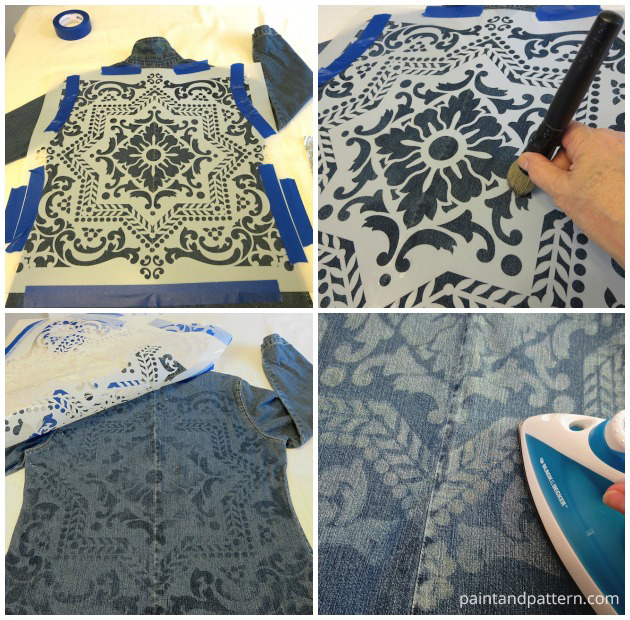 That jacket + that stencil + that technique…so very cool, I have to try it! 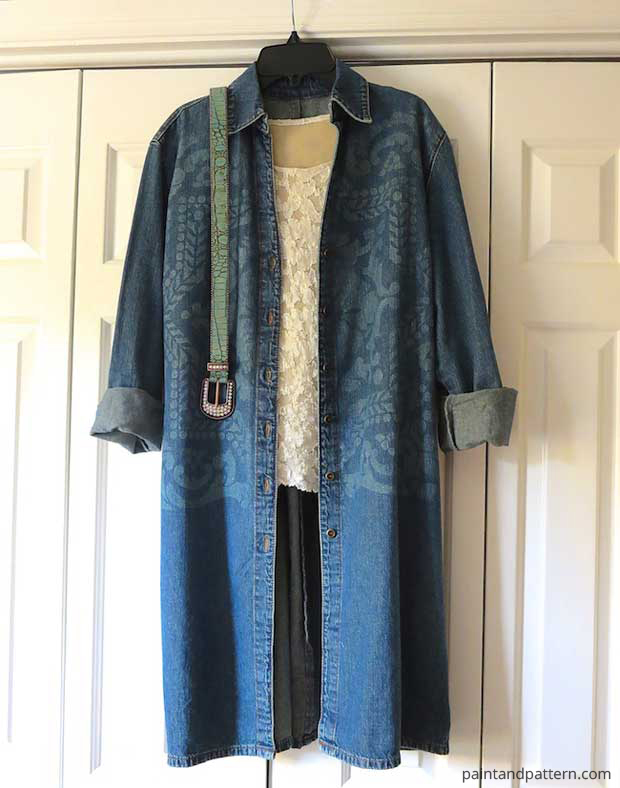 I have a really great long “free people” denim shirt I just picked up at My Sisters Closet….it would work great. Unless of course I win this fabulous jacket…then I’ll have to do a piece of fabric…the possibilities are endless! Thanks for the great post! Thanks everyone! Hope you enjoy this process as much as I do! Love to see photos of your projects! Denise be sure to copy and paste your comments onto my blog at mypatchofbluesky.com to enter the drawing! Watch Films Online For Free of charge at 123movies Online. My brother suggested I might like this web site. He was entirely right.This post truly made my day. You cann’t imagine just how much time I had spent for this info!Thanks! In Scotland, one of the most constant gym customers have an ordinary age of 75, while London has the mostaffordable age of fitness center goers seeing the most, at 65.